The 2019 machines feature several improvements to the machine design. A larger travel device improves tractive effort on the 2654G and 2656G machines, as well as select 2154G and 2156G models. As a direct result of customer feedback, John Deere has updated its G-Series Swing Machines to improve operator experience. From changes to machine design to new features to improve serviceability, the updated Swing Machines - including eight powerful models: 2154G, 2156G, 2654G, 2656G, 3154G, 3156G, 3754G and 3756G - offer increased productivity and uptime, providing a reliable solution for the toughest of jobs. "After successfully launching the G-Series Swing Machines in 2016, we wanted to continue to perfect the machines based on customer experience in the field," said Jarvis De Groot, product marketing manager, John Deere Construction & Forestry. "The new features, which will be available on the 2019 models and on, will streamline serviceability and improve the machine design, while still retaining the power and productivity of the original models." Earle Fawcett knew that he had squeezed everything he could out of his aged knuckleboom loaders. It was time to move on. "When you've made mill upgrades and you're putting money into your operation, but you're trying to feed it with some old equipment that's almost impossible to find parts for anymore, you have to say, look, we can't just keep running that way!" Tigercat continues to innovate with the introduction of it's new 890 logger - the largest machine in the Tigercat forestry equipment line-up - a heavy duty, purpose-built forestry carrier that can be configured for loading, shovel logging or processing. Weighing 47 900 kg (105,600 lb), it is the largest, highest capacity machine in Tigercat's purpose built forestry product line. The Tigercat FPT C87 engine delivers 245 kW (330 hp) at 2,000 rpm for Tier 2 and Tier 4 emission compliance. Fecon introduces the latest addition to their lineup of forestry mulchers, the Stage-5 compliant FTX300 Mulching Tractor. This low-ground pressure (3.9 psi) tractor features an oscillating undercarriage with 30" track shoes, providing balanced traction in hard or soft conditions. A spacious cab features air suspension and a heated seat, as well as a new larger touchscreen IQAN display, and keyless ignition with security, for operator comfort and control. A tilting cab and wide engine compartment doors on the side and rear, simplify access for maintenance and service. Powered by a Cummins QSB 6.7 Stage 5 engine that delivers 310 net HP offering the latest in efficient emissions technology, and an average fuel consumption rate of just 8-12 gallons per hour (gph). Jarraff Industries has unveiled a new version of its recently rebranded brush cutter, the LineBacker (formerly Geo-Boy). The new LineBacker brush cutter features a four-quad track undercarriage, an industry exclusive feature. The new quad track configuration provides users with unparalleled mobility in the most challenging terrains. John Deere is excited to announce the release of its TimberMatic Maps and TimberManager technology offerings, new streamlined software solutions for loggers designed to enhance machine connectivity and communication. Available for John Deere wheeled-cut-to-length equipment, the revolutionary TimberMatic Maps and TimberManager software is another way John Deere is continuing to help customers optimize machines, increasing productivity. Caterpillar, Inc. has entered into a preliminary agreement with Weiler, Inc. to sell the Cat purpose-built forestry business. The sale is subject to negotiation of a final agreement, the closing of which is expected by early 2019. John Deere has introduced two new G-Series wheeled harvester models, the 1170G and 1070G. The new midsize machines provide loggers with the power and precision needed for today's jobsite, while a more comfortable operator station ensures loggers are productive all day long. The availability of the Intelligent Boom Control (IBC) technology on the 1170G further increases operator efficiency, regardless of the application. Komatsu America Corp. has previewed its new XT-5 Series of Track Feller Bunchers. Models include the XT430-5 (non-leveling), XT435L-5, XT445L-5 and XT465L-5, which replace the prior XT-3 Series machines. Caterpillar announces the launch of two new Cat Forest Machine models, the 548 and the 548 LL. 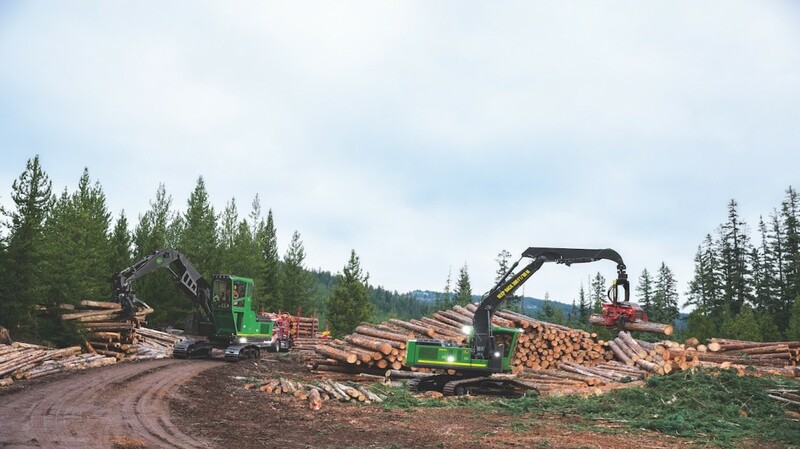 These machine platforms increase profitability for loggers by maximizing efficiency, increasing production, and reducing owning and operating costs. Hurricanes, nor'easters, snow storms and infestations of emerald ash borer have been taking a toll on trees in Massachusetts for several years. For arbourists like Jason Yerke, of Distinctive Tree Care, it has been a challenge to keep up with demand for clearing roads and power lines. But with the arrival of his new Sennebogen 718 M "E" tree care handler, Yerke feels he now has the right tool for the job. "It's like, year after year, you go off to war with a musket," he says, "and then one day you show up with a machine gun!" To better support customers, John Deere is excited to announce new equipment and warranty additions to its forestry certified used program. The program, which ensures the value and reliability of used forestry equipment, will now include L-Series skidders and wheeled feller bunchers. Additionally, the warranty choices for all certified used skidders and wheeled feller bunchers now include an option to extend up to 12 months, in addition to the existing six-month offering. John Deere has announced the integration of Waratah's TimberRite H-16 Control System on John Deere tracked harvesters and tracked swing machines equipped with Waratah 600-Series Harvesting Heads. Previously only available for the 200- and 400-Series Waratah heads, this productive and efficient system has been expanded for use with the 600-Series heads, providing loggers with a solution that enhances connectivity for data and information sharing. In 2017, Tigercat developed and released its most compact skidder platform, the 602 series. The prototype 602 skidder was sent to France last summer to be fitted with a Belgian designed and manufactured swing boom for use in mountain regions of Europe. The John Deere 3756G Forestry Swing Machine has been recognized with a GOOD DESIGN Award® for its design excellence and innovation. The GOOD DESIGN Awards Program is known as the oldest, most prestigious design award, and is organized annually by the Chicago Athenaeum Museum of Architecture and Design and the European Centre for Architecture, Art, Design and Urban Studies. "The decision for our second SENNEBOGEN was a lot simpler than the first," Steven Freeman recalls the trials and deliberations that led his family to purchase a SENNEBOGEN 830 M-T log-handler four years ago. "Our yard is tough: it's rock, and wood debris, and some mud, and the stud yard is up the hill, 300 to 400 yards from the mill. It's a cruel environment for a machine."